On Wednesday the Advertising Standards Authority (ASA) published an update on its ruling against Healing on the Streets (HOTS) – Bath. 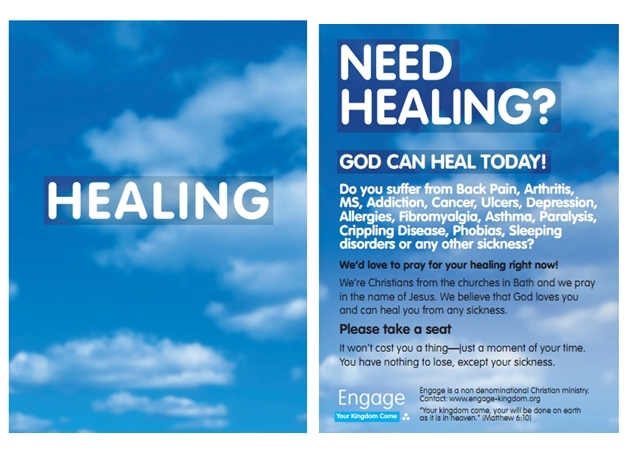 Following a single complaint against the Christian group jointly run by churches in Bath who regularly go onto the streets outside the Abbey and offer to pray for healing for passers-by, they were told that they could not produce any literature that suggested that God can physically heal. They were also banned from posting testimonies on their website from people telling of how God has healed them. If you want to know more about the background to this story you can read my original article on the ASA’s judgement back in February. Following the initial ruling, HOTS – Bath appealed against the decision. This is the first judgement and this is the updated one. ‘We are grateful to the ASA’s Independent Reviewer and the ASA Council for reviewing and amending this decision, and confirming that there was a fundamental flaw in the original assessment of the complaint about our website. By admitting that ruling against the website was outside their remit, the ASA has unfortunately demonstrated their own lack of judgement in regards to the original decision. Given that their role is to make sure that companies and organisation stick to advertising legislation, it is distinctly worrying that they have shown a lack of understanding of the very legislation they seek to uphold. Their conduct unfortunately undermines their reputation and vindicates the levels of frustration expressed by those supporting the work of HOTS which has included MPs and major Christian organisations. 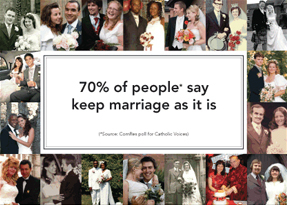 As an aside the ASA also ruled this week that this recent Coalition for Marriage advert run on some websites was not offensive. Common sense dictates that they could not have come to any other decision, but the fact they chose to go through the formal investigative process again leads to the conclusion that there are some people at the ASA who are failing to do their jobs properly and misunderstanding the nature of their role. You can read much more about this at Archbishop Cranmer. It is a relief then that the ASA backed down on their decision against the HOTS – Bath website, otherwise the complaint raised against it could easily be applied against any faith organisation working in the public sphere. The implication that statements of faith should be controlled under advertising regulations would lead to a ridiculous and unworkable situation. Finally after a good deal of fuss, some sanity has prevailed. It has to also be said that the ASA upheld the decision against the HOTS leaflet. They still will not allow HOTS to state any beliefs relating to God being able to physically heal on any literature that they give out to the public. HOTS – Bath have said that they have changed their leaflets to reduce the chance of people misunderstanding what they are offering and to do their best to comply without watering down what they do, but this is not seen to be sufficient. The ASA’s inability to differentiate between stating beliefs and stating fact is still concerning, as is their unwillingness to try to reach a satisfactory outcome with HOTS – Bath and take healing testimonies seriously, but if you look at the original leaflet it’s not totally surprising they had a problem with it. In one sense this whole affair is not much more than a storm in a teacup. The ASA has not stopped the work that HOTS – Bath are doing. They have not changed the way that they pray for people. They certainly haven’t stopped God healing people or caused those who have receive answers to prayer to doubt what has happened. What has been achieved is that a single complaint from someone who disagreed with what they saw has resulted in the work of HOTS – Bath being talked about in the national media with some of those who have been healed being given a platform to share their testimonies. An attempt to hinder the Gospel has instead become an opportunity for it to be spread. Throughout history whenever attempts have been made to suppress the Gospel, they have failed. When we see perceived or actual persecution of the Christian faith, we need to remember that God is quite capable of defending Himself. Even when things appear tough, and I’m certain there are going to be plenty of tough times ahead for some Christians in this country, we mustn’t forget that God is in overall control of things. As long as we can hold on to this, we shouldn’t fear what lies ahead. Thanks to Richard Barker for bringing this to my attention in advance. Thanks John and Phil. Then Jesus came to them and said, “All authority in heaven and on earth has been given to me. Therefore go and make disciples of all nations, baptizing them in the name of the Father and of the Son and of the Holy Spirit, and teaching them to obey everything I have commanded you. And surely I am with you always, to the very end of the age.” (Matthew 28:18-20). If we stick to this I’m confident that God will sort the rest out. The thing about the advert is that it is making claims that cannot be supported by facts. There is no evidence that prayer for healing works, except possibly as a placebo. Sorry John, I’ve just found your comment in my spam box. I think anyone who did some serious research into this might well end up disagreeing with you. Most definitely, Gillan. I strongly disagree with all such unfounded and un- or ill-informed opinion. John, it’s obvious you don’t know anyone who’s been blessed with the joy of unexpected healing. Recently I met two ladies who, like me, are most happy at having been made redundant – as 24/7 carers for wheelchair-bound folk who now walk unassisted!! Serious studies have been carried out and they have found that prayer has a negligible effect on outcome. This Wikipedia article summarises several of the studies. Perhaps if you can get it past an ethics committee (and find the volunteers) you should carry out your own double blind study. Divide a group of cancer patients into two. Half receive treatment according to the current cancer treatment protocols, half receive only prayer. See which group has the larger number of five year survivors. If the prayer group has as many or more than the treatment group I will accept the evidence. Anecdotal evidence is not evidence it is anecdote, but I shall add my own anecdote, the two people I have known who refused cancer treatment and relied on prayer are both unfortunately dead. I do not say that modern medicine would have saved them, but they would have had a better chance of being with us if they had accepted the treatment offered. The problem with trying to analyse prayer scientifically is that you’re going to have limited success. You’re measuring whether there is any difference if someone is prayed for but also if prayer is answered consistently. Measuring prayer is not like adding chemicals together. You’re trying to measure something spiritual using rational methods. If we could accurately predict the outcome to praying then that would fundamentally change our understanding of prayer. What we can do is find examples where people claim to have been healed and see if they are genuine. I’ve met plenty of people who believe that God has healed them of something. Are they all deluded? John, thank you for the link which indicates a variety of various conclusions, all far from being clear-cut. That is only to be expected because many variables (eg. psychological and spiritual factors) affect precision of methodology, measurement and repeatability. The best objective and true scientific experimentation is in normal physical sciences, completely independent of human influence. This precision reduces greatly when venturing into the scientific ‘fringes’ of the paranormal or supra-natural, where the discipline is open to subjectivity. 1. prayer involves relationship between people and God; thus, it isn’t a formula. 2. it posits a communicative process between humans and a transcendent god. 4. this same God has stated that he is not to be put to any test (other than in generosity)! Also, ‘anecdotal’ is defined as: ‘(of a story) not necessarily true because not backed up by facts’. Your implied attribution of the last definition casts doubt upon the probity of my very brief accounts (inaccurate at best, dishonest at worst), does it not? But I can assure you that our personal and documented ‘before’ and ‘after’ factual evidence meets BOTH OED criteria. It’s doubtless difficult to acknowledge a short, simple conversation can result in a collapsed cripple getting up and dancing – it just does not compute! Just one valid instance alone of answered prayer is sufficient to prove God heals, but hundreds if not thousands of cases of evidence (some documentary) actually exist – so ‘scientific’ trial is superfluous. I put it to you that this real evidence witnesses to the existence of God and shows the truth of the Good News of Jesus Christ – the most vital need of one’s personal existence. May you be blessed by a profound personal and growing knowledge and recognition of Him. Yes I agree with John that the cancer sufferers he knew may have had a better chance with treatment rather than relying on prayer alone. Our compassion goes to all sufferers yet, as in most important matters, we are free to choose and ‘God moves in a mysterious way His wonders to perform’. Those whom John refers to must have been blessed with a very rare, strong assurance of life everlasting. Even so, some believers can be presumptuous in blindly believing they will be healed of sickness. Some teachers make nonsensical claims about why people don’t get healed. The fact is, we don’t know why that happens. Although not having the full picture, we do however know God works out everything for the personal good of those who love Him. Lastly, three years ago medics gave a severely sick friend only 3 months to live. Prayer then helped her gain an unexpected reprieve, followed by a proper assessment and fresh treatment for the cancer. She’s recently returned from Spain – thank you Lord! 1 It’s likely that the Bath HOTS team followed many ministries’ good practice of orally advising clients to consult GPs. (That lone complainant admits on her website to being on a ‘crusade’ against claims offering ‘hope where hope does not exist’, and to not having enquired of anyone on the HOTS team about its claims.) Nevertheless, it is good to have clarification on these issues. 2 In addition to your wise words, we do need to garner and steward good evidence of healings. I referred to this weakness in my first post on the issue, submitted my wife’s documentary evidence for use on Bath’s website and have since collected accounts of notable instances of God’s healing hand. 3 Yes, the Lord is in control and will defend His Gospel. Even so, we’re required to take a stand in preaching and debate, declaring Gospel truth and refuting falsehood, even when turning the other cheek. Thus may people again learn to distinguish right from wrong and about the purpose of Christ’s death for each of us. 4. As we’re living in times of apostasy (as Paul prophesied? – 2Thess2:3) we shouldn’t be surprised by events. Matthew 28 “teaching them to obey everything I have commanded” gives an indirect but absolutely clear rebuke to ALL clergy and laity who’re engaged in or supporting sinful practices. His warning at Rev 3.5 implies that, if remaining unrepentant, such would have their names blotted out of His Book of Life. So let’s expect a sifting – or even their being cut off from the Vine! Thank you Richard for your wise words. Having spent a short amount of time with the HOTS – Bath team I am convinced that they are carrying out their ministry in a sound and responsible way with the best interests for those they pray for at the heart of what they do, which is why I’ve been so irritated with their treatment. I agree to that collecting and testing healing testimonies is important as the evidence is there that God does heal, but often it is difficult to find recorded examples. They tend to be word of mouth. You’re right too that we shouldn’t sit back and think God will do all His work Himself. We’ve been commissioned to be his ambassadors here on Earth and for the majority of the time people will see God and His love through the way we live. We should never be seeking revenge for the way Christians are treated sometimes. We should always rise above this. What critics tend to overlook is that medical matters are confidential between patient and doctor. Nina was willing to get copies of her GP and hospital records but for which the application form required attestation of her identity plus indemnity for the hospital before authorisation. So, for the time being, we published what she has personally to hand. I enquired of Church of His Presence, Mobile AL about access to their many folders of medical evidence of healings (eg as shown on video clips) but was informed that State law precludes their copying confidential records. I can understand atheists cannot grasp that someone crippled for years can suddenly become normal after being in a conversation; to them it doesn’t compute, or would ‘bust-a-brain’! Shame they miss out.